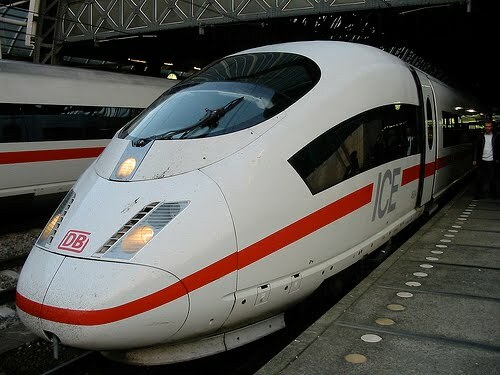 Pictured here is Amsterdam's ICE train, capable of 200+ mph. No wonder the Danes are said to be among the happiest people on earth. They're among the most heavily taxed, but they sure know how to get around – by bike and by train. Well, it’s pretty clear we won’t support fast trains if we don’t have fast trains! Ms. Schiavo also said it isn’t fair that each D.C. Metro rider’s fare is subsidized $2 by the local taxpayers. Would she rather see that money – and a whole lot more – spent on expanding highways that are already overcrowded? Meanwhile, as a citizen of the most prosperous and powerful nation on earth, I can’t even get snail rail service from Louisville to Cincinnati, Indianapolis or Nashville! Yet just about everyone I know gets absolutely giddy whenever the prospect of rail travel gets the least bit of discussion. It’s a fact that Main street America has been yearning for fast rail for decades. That we don’t take it seriously is a national disgrace. To attend the National Bike Summit last month, I was determined not to use a car or plane. I rode my bicycle 130 miles to Cincinnati’s Union Station, where I boarded the Amtrak Cardinal to D.C. for a 14.5 hour trip. I had to box up my bike to load it in the baggage car. It was a very slow roll. While in D.C. I learned that people will indeed use faster trains and they’re willing to pay for them – even if they don’t use them! In just a couple of years, the Metro lines have helped D.C. reduce the number of cars on their roads by 15,000 – even while the population increased by 16,000! According to the American Automobile Association (AAA), every time you take a car off the road you keep more than $7,000 a year in your local economy. In D.C. that means more than $172 million a year. Money to spend on fast trains and bike lanes. If we truly want cleaner, more efficient, more sustainable, more convenient, and less expensive transportation choices, we need to stop asking the same old questions and stop asking the wrong people. With all doe respect, Mary Schiavo essentially works for the airlines. Do you really think her bosses would appreciate her promoting fast trains on the radio? How long can we afford to move like snails in a dense fog of public and private subsidies that hide the true cost of an outdated highway system? And in the current economic chaos do you really think taxpayers and motorists will be eager to give a green light to spending billions on fast trains as long as they can enjoy the biggest welfare system ever invented? Yes, I said WELFARE SYSTEM! It’s easy to forget that the highway contractors and their powerful lobbyists are on a taxpayer-funded gravy train loaded with good old boy patronage jobs. They, after all, were beneficiaries half a century ago, when the auto industry systematically derailed local trolly lines and ordered them paved over. So, before you get too jazzed about the high cost of subsidized fast trains, take a look at what we’re currently spending on welfare for motorists, the highways they travel, and the bailouts for manufacturers of their vehicles. But I’m saving the truly rich, lumpy gravy for last: Tax-inclusive subsidies for petroleum are the biggest global hidden cost in the world of transportation. These worldwide freebies for Big Oil are estimated to cost $740 billion in 2010! So instead of whining about the high cost of fast trains as some dreaded plot hatched by the socialists abroad, let’s start thinking about the future cost of NOT building efficient rail networks! We’re decades behind, but it’s not too late to shift the discussion and quit living within the fantasy that our current infrastructure and motoring status quo are somehow sustainable. Before we throw up our hands and roundlyproclaim fast rail as too expensive and lacking in taxpayer support, let’s first openly examine the real costs and all the subsidies that currently prop up American highways, our auto industry, big oil interests and, yes, even the airlines. The time is way overdue, but let’s make up for lost time and set aggressive goals for a national fast rail system. Tell your senators to support high speed rail in America. 3 Comments on "In Defense of Fast Trains"
Kirk, I ran across this doing a little research on Louisville. Long time since I heard your name.